The Medal of Honor is the U.S. military’s highest award for valor. Discover more about this nation’s bravest heroes by exploring Fold3’s Medal of Honor Recipients title. Compiled by congressional committee and originally spanning the years 1863 to 1978, Medal of Honor Recipients was recently expanded to include additional names from 1979 to 2013 for more than 3,400 entries on those who received the Medal of Honor. The first volume (1863–1978) contains an in-depth history of the Medal of Honor. For instance, did you know that in 1917, 910 names were removed from the Medal of Honor Roll because the Board ruled their actions didn’t merit the award? 864 of them were from the same regiment. This first volume also lists recipients by conflict, recipients by state, foreign-born recipients, recipients in alphabetical order, and other (non-recipient) names mentioned in the citations. The 1979–2013 addendum encompasses additions and changes to the earlier volume. 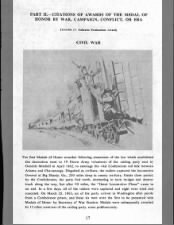 It includes information on recent recipients, as well as information on those retroactively given the Medal of Honor (including 22 Asian Americans and 7 African Americans from World War II). 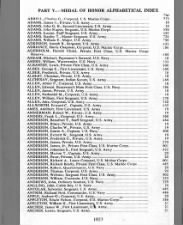 Information included—when available—for each Medal of Honor recipient is name and rank, organization (e.g., company and division), the date and place of their Medal of Honor action, their date and place of birth, and the citation text. Recipients come from all branches of service, and although early citations are often shorter, more descriptive citations are available from about World War I on. Within the pages of Medal of Honor Recipients, each name preceding a citation is selectable. Selecting the name will bring up a box containing basic information pulled from the citation and the Honor Wall. Selecting the person’s name at the top of this box will take you to the person’s Honor Wall page, which you can explore or expand, depending on your preference. As we approach Memorial Day, take some time to honor this nation’s heroes by learning more about them and their bravery in Fold3’s Medal of Honor Recipients and on the Honor Wall. Someone needs to fix the Contact Us page. I have no OTHER WAY OF CONTACTING YOU ALL AND I’M A PAID USER!!!! Every single time I try to submit something I am getting “Message not sent. Make sure that your email address is valid. And that your message is filled out.” Well of course I have my message filled out and you already put my email address in there as I’m signed in! I went ahead and typed it out myself, wondering why you weren’t accepting it but I got the same message. I went to the terms of service page, hoping to find a direct email address and nothing. I went to the privacy page, hoping to find a direct email address and nothing. Basically, you want people to pay for your service but you just don’t want us asking about it. Right? How can a company be dumb enough to NOT make an alternative way of contacting them? What if it was a sign in issue? How would I reach anyone at all? Because there is no other way, I am posting it here. I will leave it up to you to take care of this and be sure to let them know how irritated you are about it, so it’ll be fixed. Else I won’t be the only one, I’m sure. I’m using Windows Vista on Google Chrome Version 34.0.1847.137 m. Oh and don’t tell me to use Internet Explorer because it’s not going to happen. Ever. I’d rather stick needles in my eyeballs than use that. Thank you for your feedback. Please contact us at support@fold3.com or 1-800-613-0181. We have tested the form and are unable to duplicate the issue except in the case where the @ or the .com are missing from the email address.